ATHENS, Greece (AP) -- A clutch of modern pagans honored Zeus at a 1,800-year-old temple in the heart of Athens on Sunday -- the first known ceremony of its kind held there since the ancient Greek religion was outlawed by the Roman Empire in the fourth century. The group ignored a ban by the Culture Ministry, which declared the site off limits to any kind of organized activity to protect the monument. But participants did not try to enter the temple itself, which is closed to everyone, and no officials sought to stop the ceremony. "Our message is world peace and an ecological way of life in which everyone has the right to education," said Kostas Stathopoulos, one of three "high priests" overseeing the event, which celebrated the nuptials of Zeus and Hera, the goddess of love and marriage. To the Greeks, ecological awareness was fundamental, Stathopoulos said after a priestess, with arms raised to the sky, called on Zeus "to bring rain to the planet." "Our hymns stress the brotherhood of man and do not single out nations," said priest Giorgos Alexelis. For the organizers, who follow a calendar marking time from the first Olympiad in 776 B.C., the ceremony was far more than a simple re-creation. "We are Greeks and we demand from the government the right to use our temples," said high priestess Doreta Peppa. Christianity rose to prominence in Greece in the fourth century after Roman Emperor Constantine's conversion. Emperor Theodosius wiped out the last vestige of the Olympian gods when he abolished the Olympic Games in A.D. 394. Several isolated pockets of pagan worship lingered as late as the ninth century. "The Christians shut down our schools and destroyed our temples," said Yiannis Panagidis, a 36-year-old accountant at the ceremony. 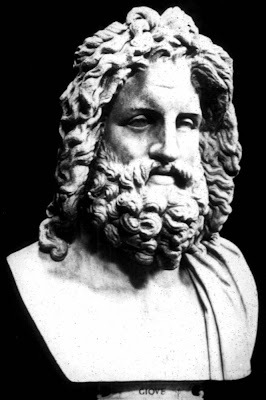 Unlike the monotheistic religions of Christianity, Judaism and Islam, the old religion lacked written ethical guidelines, but its gods were said to strike down mortals who displayed excessive pride or "hubris" -- a recurring theme in the tragedies of Euripides and other ancient writers. "We do not believe in dogmas and decrees, as the other religions do. We believe in freedom of thought," Stathopoulos said.